I recently went home to Texas to celebrate my parents’ 50th wedding anniversary. During brunch, my dad ordered masa-based pancakes and didn’t know what to expect. He was concerned that they might come out heavy or dense, like masa-based tortillas or breads. Much to my delight (but especially his), they were exceptionally light, fluffy, soft, and delicious. It made me so happy to see the king of pancakes enjoying a modern twist on a classic the morning after a big celebration. As a kid, I always loved when my dad would make pancakes for dinner. I loved the sense of culinary rebelliousness. We were breaking the rules in a fun way, together. During these evenings, my dad taught me the subtle wisdom of well-timed pancake flipping. I’ve proudly inherited an eye for that slight change in batter sheen and the emergence of tiny, bursting bubbles. 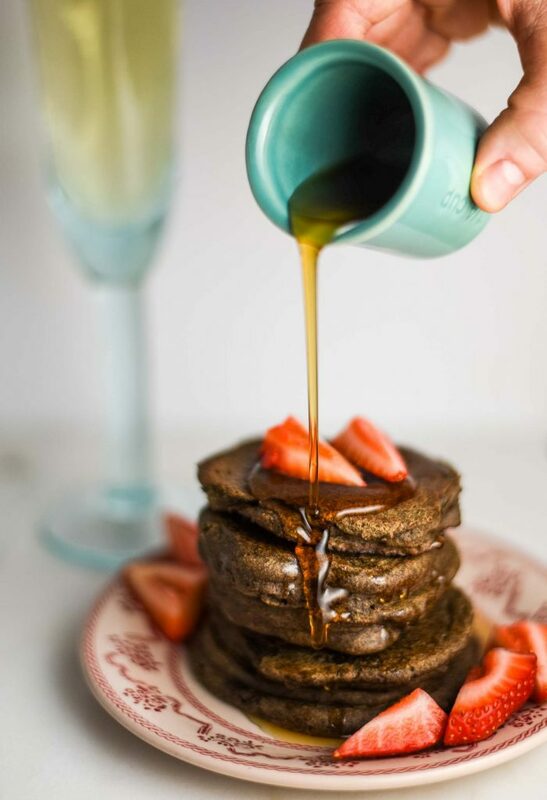 These vegan buckwheat pancakes are an ode to my dad and his relentless appetite. Rather than compete with the masa miracle my dad experienced, I opted for a new spin on the traditional by experimenting with buckwheat. Buckwheat is derived from the seed of a plant that is related to rhubarb;. It’s not actually a grain or wheat-based, so gluten-free folks start frolicking. Sauternes: Sweet white wine from Bordeaux, France that has developed Noble Rot. Noble Rot sounds like a bad thing, but it is actually a beneficial type of fungus that produces concentrated sweet wines. Cava: Light bodied sparkling white wine from Spain from three primary grapes: macabeo, xarello, and parellada. High acidity lends a nice palate cleansing in between maple syrup pancake bites. Muscat Blanc: Fruity, sweet, and acidic Italian white, with mandarin orange, pear, lemon, and honeysuckle flavors. If you want the classic version, go for Moscato d’Asti or if you want a really sweet version, go for a dessert version. 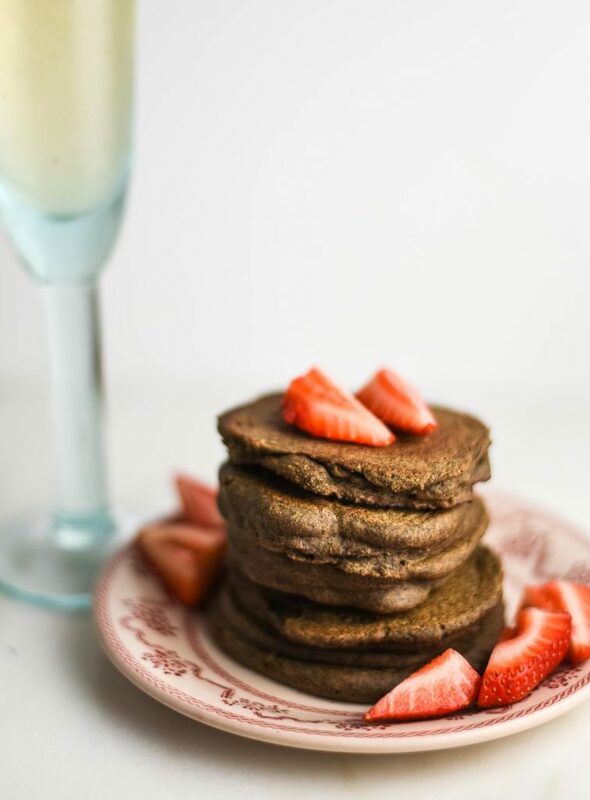 Simple buckwheat pancake recipe – vegan, gluten-free, and dairy-free deliciousness. 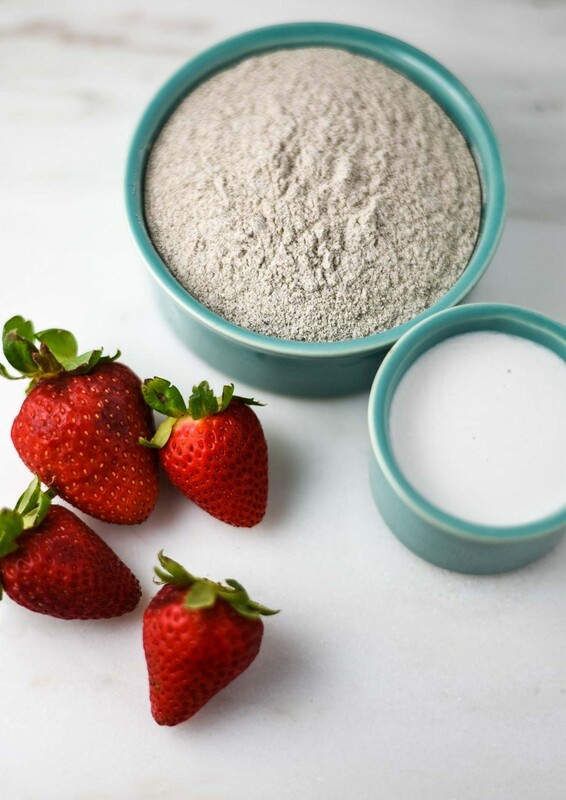 In large mixing bowl, combine flour, salt, baking soda, baking powder, and ground cinnamon. In different bowl, combine wet ingredients: coconut milk, water, maple syrup, lemon juice, and almond butter. Whisk until combined evenly. Slowly pour wet ingredients into dry ingredients. Stir until evenly mixed. Add more water (1-4 tablespoons) as needed to get desired consistency for batter. If you prefer thick pancakes, add less water. 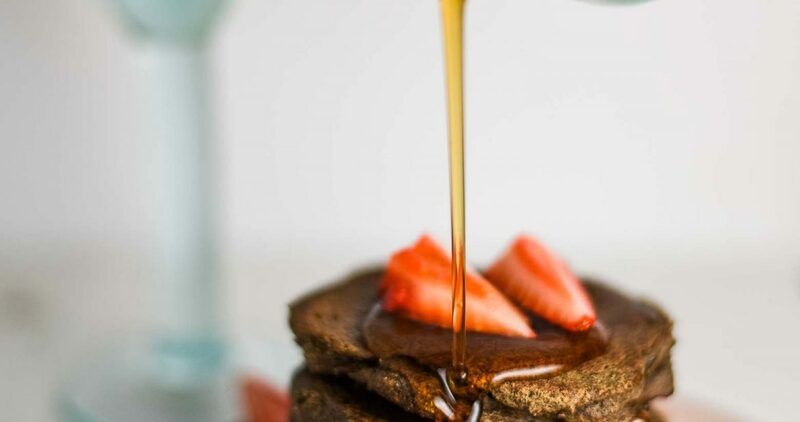 If you prefer thin pancakes, add more water. Heat frying pan or skillet on the stove. Spray with oil spray or lightly grease with oil. Spoon 2 tablespoons of the pancake batter for each pancake. Cook pancakes until small bubbles begin to appear and burst on the top side. Once bubbles burst, flip pancakes gently. Cook until browned on the other side. Serve immediately. Best when fresh but can be stored in refrigerator for 1 day. Reheat in microwave for 30 seconds to 1 minute. 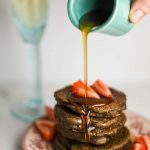 These look delicious and I love your photography too! Thank you! They are tasty!